Finely chop half of the cilantro and place in a large bowl. Add ground pork, half of the curry paste, and egg. Combine with your hands until thoroughly mixed—don’t worry about over-mixing here. Season with salt and pepper. Use a spoon to roll the meat into small meatballs, about the size of a gumball. Chill in the fridge for approx. 10 min. Meanwhile, bring two thirds of the water and all the rice to a boil in a covered pot over medium-high heat. Once boiling, uncover, and reduce heat to medium until rice is cooked. Remove from heat, fluff with a fork, re-cover, and set aside. Bring a small pot of water to a simmer. Use tongs to add the meatballs one at a time and let cook just until they hold their shape and no pink shows, approx. 5 min. In a frying pan over medium heat, add some oil and fry the meatballs until brown on all sides, approx. 8 min. Remove and set aside. Add the remaining curry paste to the frying pan. Once it starts to stick to the pan, add remaining water and use a spatula to scrape up any bits from the pan. Let boil and reduce, approx. 5 min. Transfer meatballs to the pan and coat gently with the sauce. 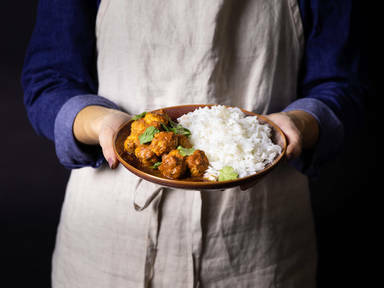 Serve meatballs and curry sauce with warm rice and garnish with remaining cilantro. Enjoy!